The Order of the Argent Sword (formerly known as Trimarian Sword) (O.A.Sw.) is the premier fighting award and is given for excellence in, education in, and the fostering of, the art of heavy weapons combat and exemplary courtesy. 1.) Know that We the Crown Trimaris declare that honor must go to those who not only show prowess upon the field of combat, but who also give of their time and skill to train those who will succeed them. Hereupon this _______ day of _________, A.S. ________ We summon _______________ to be proclaimed as Companion of the Argent Sword Trimaris. _____________, and so do this day name them as a Companion of the Argent Sword Trimaris. Signed by Our hand upon this _______ day of _________, A.S. ________. 4.) All know that prowess on the field upholds and maintains the honor of a Kingdom, and those who foster the fighting arts share greatly in that honor. We the Crown of this Laurel Kingdom of Trimaris, do herewith commend Our good _______________ for skill and gallantry, and do name them a Companion of the Argent Sword Trimaris on this _____ day of _____, A.S. ______. named a Companion of the Argent Sword Trimaris. Done by Our hand this _____ day of _____, A.S. _____. 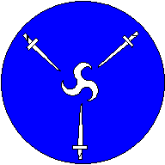 Azure, a triskele between three swords in pall points to center argent. (Formerly known as the Order of the Trimarian Sword.